Stories are complex, and so far we’ve only addressed the premise and plot. We’ve made no mention of a narrator, the one who tells the story. For novels and particularly playwrights and screenwriters, the author might say, “That’s me. I tell the story.” But that’s not true. The author always creates the narrator, consciously or unconsciously. We speak of this as the author finding his/her “voice.” But most authors write in many narrative voices. For a novel, the narrator is easy to identify, but more difficult for the theatre and the big and small screen. Sometimes they do have a voiceover, but the “narrator” or storytelling element is a combination of writing, directing, photography, and scene editing. It still has a style, and that is effectively a narration because it constitutes the way the collaborators choose to tell the story — its point of view. In any case, the narrator is an element in the story, and it has no place as yet on our plot pentagon/mandala. Subplots are also missing from our depiction of storytelling. Not only do stories have a central plot, but also several subplots, which broaden the subject matter and help the story to spread out and occupy the entire fictional world. Subplots are sub-conflicts that have all the components of the central conflict, including a premise for each. All these sub-conflicts have to be locked and resolved, just as does the central conflict. And yes, they have all five plot points. The author should identify the characters involved in these sub-conflicts and draw a plot pentagon/mandala for each. And yes, each sub-conflict has an associated theme. Once that’s accomplished, one might well wonder how all these plot pentagons relate to each other. They certainly have a relationship in the story, so we might also ask if a geometric metaphor exists that illustrates this connection. Any such diagram would of necessity be quite complex. The pentagons are connected and apparently somewhat sequenced. As each accomplishes a circular motion in time, its story unfolds. The plot pentagons are connected but not dependent on each other. This is the same as in real life. We all lead separate lives, and each of us is the hero of our own story. We tell the story from a primary point of view, generally but not necessarily, that of the protagonist. I have constructed what I call a sub-plot pentagon (see Figure 6-2) for the protagonist of the Civil War story I mentioned in Chapter 2 and provided a series of possible conflicts and sub-conflicts associated with it. My experience has been that to fully flesh out any character, the author has to write the character from their particular point of view. This would mean that each character should get some time in the drivers seat, so to speak, and their interaction with other characters told from their own point of view. The author has to spend a certain amount of time inside the head of each of his/her characters. This material should then be integrated into the story as told from the story’s point-of-view character. I would also take this lack of dependence as a sign that chaos plays a role in storytelling. We’ve imposed some pretty strict rules on plotting, but over-plotting leads to a contrived storyline. Therefore, once you achieve a modest level of plotting, let chaos play its role. It has to have a role because life is to a certain extent chaotic. Not all songs have the same thirty-two bar form either. 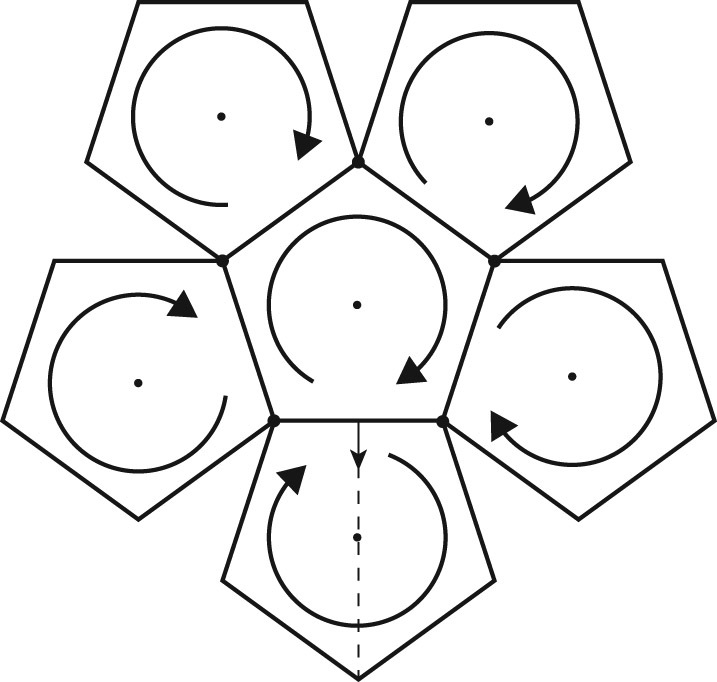 If we print out this connected set of five pentagons on construction paper and cut out the figure, we can then bend down the exposed pentagons, creasing the common edge with the central plot pentagon, until the edges of all five external pentagons touch. This creates a three-dimensional object that represents a good number of our sub-plots. See Figure 6-3. Notice that the arrow indicating story progression in this second set, viewed from the inside now, goes counterclockwise instead of clockwise, something I’ll come back to in a minute. The crazy thing about these two bowl-shaped halves is that the irregular edges look as if they’ll fit together. When we try to mate these two halves, we rotate the second one 180 degrees, and then they slip up against each other and fit perfectly. 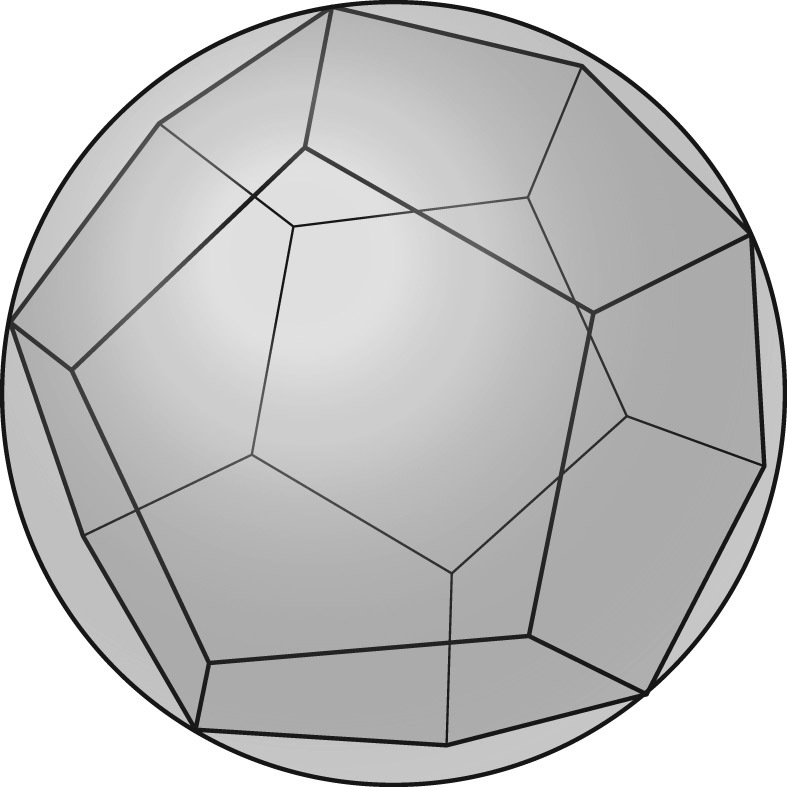 They form a twelve-sided three-dimensional object called a dodecahedron. Now you get the euphoric feeling that we have come up against something truly distinctive. The ancient Greeks, and yes again it was the Pythagoreans, also knew about the dodecahedron. It is one of what we now know as the Platonic Solids. The dodecahedron had a special meaning for the Pythagorean Brotherhood. They saw each pentagon as representing a constellation, and since they recognized twelve, they reasoned that the dodecahedron represented the Zodiac. The Pythagoreans viewed the dodecahedron as a divine model used by the gods to create the Universe. [Plato, The Timaeus, 55] And get this, the constellations were the heavenly representations of many of the heroes of mythological fame. They associated a myth with each segment of this geometric object — a perfect storytelling device. 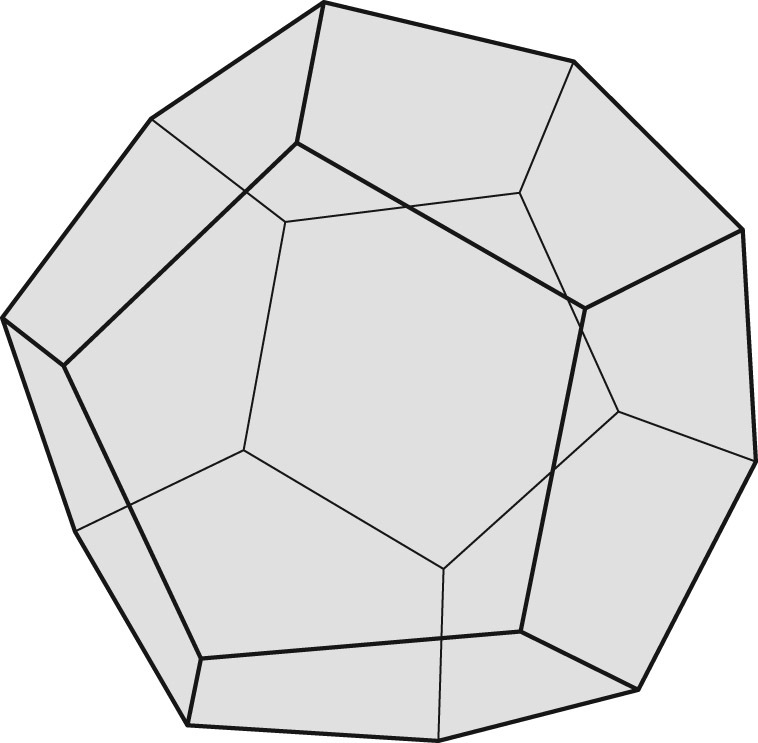 The Pythagoreans saw the dodecahedron as a divine geometric symbol, and they kept it secret. Only the worthy could know of its existence. Note the mention of not just pentagons and the dodecahedron, but also a sphere containing them, possibly the biggest secret of all. I’ll get to this a little later. The fact that we know such secrets today is in no small part because of leaks in this select society. They changed the direction of Western Civilization. Word of such forbidden knowledge spread quickly in the ancient world, and Greece benefited greatly when these discoveries became common knowledge. The Pythagoreans associated the five corners of the pentagon with the four elements, earth, water, air, fire, and added a fifth, spirit. At first glance, this seems simply naive reasoning from the ancient world. After all, we have 118 elements in the Periodic Table. But it isn’t as simplistic as you might think. We could associate this ancient categorization system with, not the elements, but our five states of matter: solids, liquids, gases, plasmas, and we could also add a psychic or spiritual element. Seemingly, this represents Earth and its inhabitants. The number twelve also plays an important role in ancient Greek religion. The Olympian gods, who ruled over Earth and Heaven, were twelve in number. In our modern world, Christians are well versed in Christ’s Twelve Apostles. Each apex of a dodecahedron joins the corners of three pentagons so that the Trinity might also play a part. It would be easy to lapse into thinking that this model of the cosmos is something that should be relegated to the ancient world; however, some of our most brilliant cosmologists today are proposing a model for the Universe known as the Poincaré Dodecahedral Space, which seemingly explains more cosmological data than other theories. This relates back favorably to the Pythagoreans and their belief that the gods used the dodecahedron to create the Universe. For the storyteller, the dodecahedron so developed would represent the entire fictional world within which her/his story takes place. We have something that no longer represents just an element of the fictional construct but one that contains the entire imagined world of any story. Now let’s go back to the step just before we joined the two halves of the dodecahedron. Remember that when viewed from inside, the story progression arrow on the far side of the dodecahedron of Figure 6-4 reversed direction even though we’d created all the pentagons to be identical. Also, the central pentagon of that far side pointed down instead of up. This would lead one to believe that the initial plot pentagon, with its associated premise, represented just the story told from the protagonist’s perspective. If the opposite pentagon, the one in the other half of the dodecahedron that points downwards and turns backwards in time, were to represent the story as seen from the antagonist’s perspective, viewing it from this orientation would reverse everything and change the nature of the story altogether, from the premise up. We might even say that the antagonist would then become the protagonist. This is a profound revelation and says as much about conflict in the real world as it does about conflict in Story Land. This would illustrate why perspective, defined as point-of-view in fiction, is so important to meaning in a story. Each of us is the point-of-view character in our own life, just as we are the heroes of our own life stories. I have again created a sub-plot pentagon, Figure 6-6, this time for the antagonist of the Civil War story previously sketch out in Chapter 2. This is really a superficial treatment, and I did it by simply rotating 180 degrees the protagonist sub-plot pentagon of Figure 6-2 and reversing the stated order of the conflicts. Still, I believe looking at it from this perspective illustrates how the nature of the story has changed. 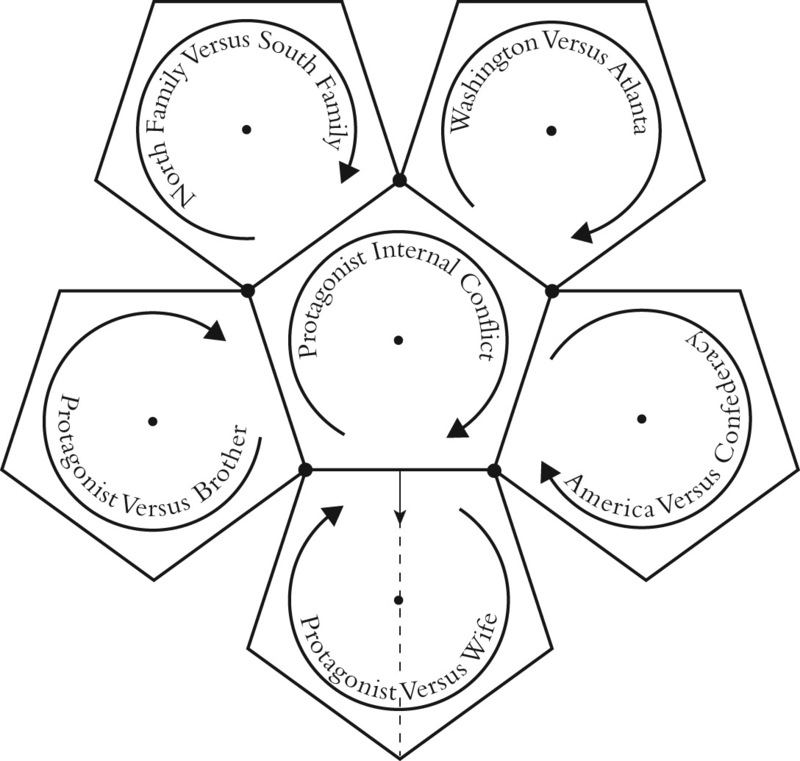 Of course, any plot pentagon in the dodecahedron of the Civil War story could be used as the point-of-view pentagon. It then becomes a much different story. We might conclude from this that moral judgment comes solely from perspective. 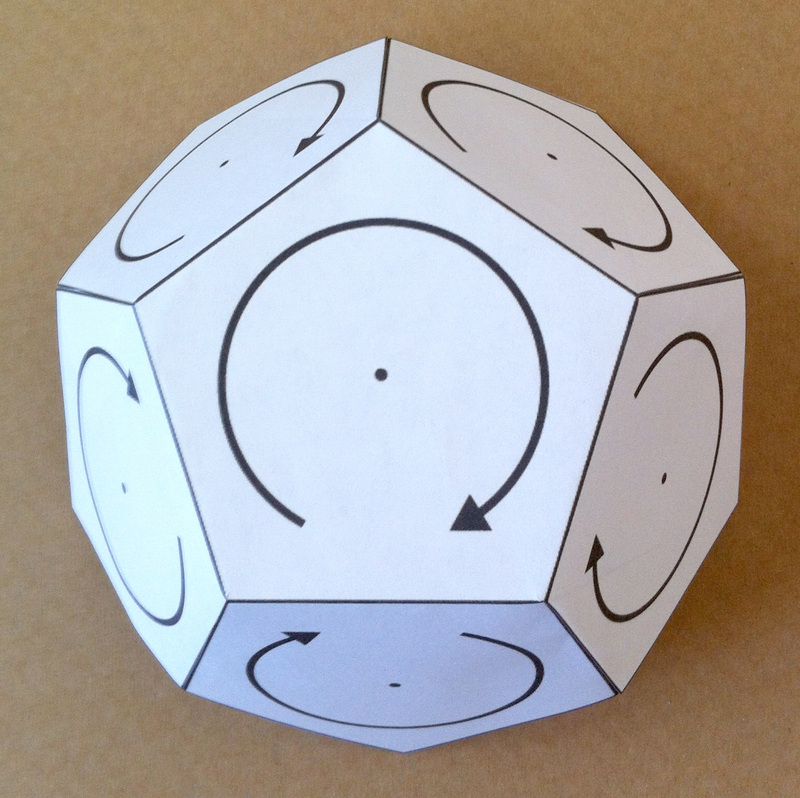 The story’s point-of-view determines the orientation of the story dodecahedron when the reader reads the story. Of course, the protagonist’s story can be told from the antagonist’s point of view. A marvelous example of this is the movie Amadeus, staring Tom Hulce as Mozart (protagonist) and F. Murray Abraham as Salieri (antagonist). Salieri, the narrator of the story, is an old man looking back on his life and friendship with Mozart with considerable bitterness. We also see that we could have told the story with one of the other twelve pentagons as the point-of-view. If so, it would have been much different, and this begs the question: Where is the narrator of this story in this expanded three-dimensional picture? Identifying the position of the narrator within this geometric structure could help limit all these alternatives. A few paragraphs back, I promised to find a place for him/her/it. Just as with the bindu/premise, which resides in the center of the pentagon, the narrator must reside in the geometric center of the dodecahedron and must enter the dodecahedron from the point-of-view pentagon to get the right perspective on the story. She/he/it is located in this fictional world and is the voice that tells this story and describes the dramatic events that occur within it. The narrator is the channeler of the story. If we viewed the story dodecahedron as an orchestra playing a symphony, the narrator would be the conductor. And one might well wonder how the narrator goes about her/his/its business and also about her/his/its relationship with the author. To uncover that kinship, we’ll have to look into Active Imagination, which we’ll do in the next chapter. Be patient. We’re getting there. Now we have a geometric representation of the entire story. It consists of a central conflict and associated subplots, all combined, interrelated and symbolized as a dodecahedron. We can envision a sphere enclosing the dodecahedron (the same sphere that cost Hippasus his life) that includes all twenty of its vertices. This is analogous to the circle in the two-dimensional pentagon. In the pentagon, the circle represented the Ouroboros, the dragon that eats its own tail. What might this sphere, as a three-dimensional extension of these individual circles, represent? It might not be so easy to prove geometrically, but intuitively we can see that such a sphere would also contain every point in every circle, all the Ouroboroses, about all twelve pentagons. This sphere would represent something that contains the entire Universe and, since it also contains all twelve dragons, be fierce and mysterious beyond imagining. No one knows for certain what the Pythagoreans believed the sphere represented, but the only concept that seems to fit is God. Although it was not highly publicized, ancient Greek religion had a monotheistic element. The father of all gods and mankind was Zeus, who ruled from Mt. Olympus. The Greeks had a saying: “All things are ultimately Zeus.” It would seem that this sphere that encloses the dodecahedron would have represented, to the Pythagoreans, Olympian Zeus. We must realize that, for our purposes, this is a fictional world and not the “real” one. Who is our creator? Of course, it’s all inside the author’s psyche. The narrator in the geometric center of the dodecahedron would then be the vehicle for channeling the author’s Collective Unconscious as the metaphorical god of this fictional universe in the Land of Story. I’m not suggesting the author construct his/her story with all this in mind. However, this geometric approach to story structure, in the tradition of the Pythagoreans and the alchemical efforts of Sir Isaac Newton, demonstrates not only its complexity and interconnectedness, but also its central unity. The fact that each pentagon expands infinitely outward and shrinks infinitely inward provides the spiritual and psychological dimensions the story must have to become fully realized in the hands of the author. All stories have as structure the assemblage of plot and subplot pentagons that form the dodecahedron. Storytelling is a natural part of being human, and it can be a part of the process that leads us to become more fully human and our natural selves. For those who choose to follow such a path, this dodecahedron must be our guiding symbol and the mechanism of our enlightenment. It provides not only the divine form to guide us, but simultaneously provides the way to becoming individuated, i.e., worthy. The writing of a novel or script is the creation of a fictional world, just as God created Earth and the Universe. We aren’t as talented, and indeed we are using materials he created, including the lives of human beings. It’s a humbling realization. We pull this material, these fictional characters’ lives, from within our own psyche, our Collective Unconscious where the Divine World resides. The stories we write we find within us, or possibly, they find us. Many can’t quit writing. We must write to be who we are. We are driven. Many writers talk of the writing process as being one of channeling rather than creation. It’s as if the story already exists, has always existed, and we are only giving it voice. This is the nature of the fictional world revealed through storytelling. I am not going to pretend that I understand all that this symbol has to tell us. I have just scratched the surface in decoding it. Perhaps it speaks to each of us differently, providing inspiration and insight appropriate to our needs and talent. It does speak to me, and in a loud voice. Conceivably, it’ll speak to you also, possibly in a different language and with unique revelations divergent from my own. This is the end of our search. The plot dodecahedron incased in the sphere is a three-dimensional divine object, proclaimed so by the Pythagoreans and kept secret under threat of death. It provides a complete view of story structure, the fictional world, and insight into the nature of storytelling. It contains pretty much everything generic that can be said about the structure of storytelling, just as Newton’s Laws of Motion contained methods for the prediction of flight dynamics. It provides a temple for the construction of all stories. As such, it is the Philosopher’s Stone. It appears that this storytelling device is what Jorge Luis Borges called the aleph. Borges’ character in his story “The Aleph” defines it as: “…one of the points in space that contain all points.” Borges’ aleph has its origin as the first letter of the Hebrew alphabet, and as such it is the letter that begets all other letters, that beget all words. We might infer that it also begets all stories in the Collective Unconscious. Borges also says: “…a Persian mystic speaks of a bird that somehow is all birds.” Surely, that is our Philosopher’s Stone for storytelling. It contains the essence of all stories. The aleph and the bindu are similar. Both are the source from which all subsequent actions proceed. Whatever the importance of these peripheral revelations, we’ve found the object of our search. Alchemists kept such knowledge secret. They felt it shouldn’t fall into the hands of the undeserving. We have gone into Chaos, discovered the prima materia, and turned it into story — a chaos-of-words to story, a divine narrative that lives on in the psyches of the world. Now, to wield the Stone, we must become worthy.